"Young lady, don't be lookin' at him with your eyes all bugged out like a cowbird's. There ain't no future in it." Though John Wayne had been a star in Westerns, both serials and grade B filler, for many years, with the 1939 Stagecoach he moved into the first rank of stars. 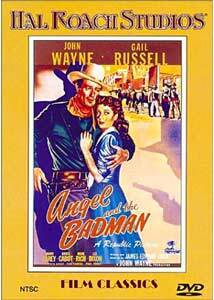 Using his newfound Hollywood clout after the war, he first acted as producer on Angel and the Badman, with aspirations to making it an A-picture. With a little deeper thematic material than usual, the effort is mostly successful. Though not exactly on an epic scale, the picture does carry a more serious theme than the usual 1940s oater. While the notion of choosing between the good girl and the outlaw life isn't exactly novel, the use of Quakerism as a moral underpinning is interesting and gives this a bit more depth than it might have otherwise have had. Penelope's temptation and the fact that Quirt's conduct puts her into a moral dilemma doesn't hurt in giving this a suitable impact. The interest is sustained by giving Quirt a mysterious past that is only gradually revealed. Wayne essentially plays himself as usual, but does it with a healthy leavening of humor. While there aren't exactly sparks from his interactions with Russell, he has numerous entertaining scenes with Harry Carey as the cynical Marshall who intends to let Quirt and Laredo kill each other, or at worst, hang the survivor. There's a sharp and biting wit in these sequences, as well as in the scene where Quirt and his pal Randy McCall (Lee Dixon) end up at a Quaker meeting by mistake. But while there's humor, the watchword in any Western is action, and this picture's chock full of it. As if to imply that there's more action than the picture can hold, a gunfight and chase sequence plays out under the titles! Wayne clearly paid attention in working with John Ford, as several familiar sites from Monument Valley show up in this chase. Noted stunt man Yakima Canutt handled the second unit scenes, including most likely this chase and the wild buckboard chase later in the film. Bruce Cabot, the male lead from King Kong, makes a serviceable villain (with requisite cowardice) as Laredo Stevens. Richly entertaining, this picture still holds up quite well after more than fifty years. Although not a bleak or cynical look at the West that we might get from Leone or Eastwood, it's straightforward fun. And for those who care, the picture features a tutorial in the proper use of "thee" and "thou." Image Transfer Review: Having fallen into public domain years ago, this film in various degrees of dubious quality has been a regular fixture in both video and DVD. This print, from the Hal Roach library, is a bit overcontrasty; blacks have no shadow detail at all. The picture is overly dark at the beginning (apparently a poor day-for-night effect), but it eventually gets better as it goes on. There is some speckling, but it's not too bad, and the frame damage is only occasional. The picture is a little soft and dupey, but there are lots of shades of grey and the whites aren't blown out as often is the case. Audio Transfer Review: The 2.0 mono is as bad as one would expect from a PD disc. There is a ton of hiss and noise, and a fair amount of crackling throughout. There's also a persistent electronic buzzing that I found highly annoying. These not insubstantial defects aside, the dialogue is generally clear enough, and the music does have a surprising richness and depth. Extras Review: There aren't any extras at all related to the feature, and the chaptering is woefully inadequate. However, fans of serials will have much to rejoice in here: the disc includes six quite rare trailers for Republic serials of the 1930s and 1940s, covering the gamut from adventure to science fiction to crime. They're in plausibly decent condition to boot, and make entertaining viewing in their own right. This public domain staple looks better than usual here, but still not quite first rate. Entertaining enough, if you overlook the print quality and the lack of extras. Serial fans will be interested in the trailers, though.